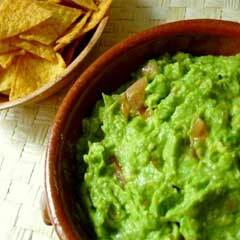 This delicious green chile guacamole is sure to be the big hit at your next party or barbecue! Cut avocados in half. Remove seed and peeling. Mash with a fork or potato masher until no large chunks remain. Add green chile, onion, garlic, cilantro and lemon/lime juice. Stir until blended. Add salt and freshly ground black pepper, to taste. Cover with plastic wrap promptly to prevent browning. Chill and serve with tortilla chips.